Soak CEG Cod bits for at least 30-40 min. For best results, soak them overnight. Place cod bits in fresh cold water, bring to a boil, drain, repeat, and set aside. Saute onions, tomatoes, and escallion. Add flaked cod bits to mixture. Saute briefly for flavors to blend. Drain ackees and stir into saute mixture. Simmer for 5 min. 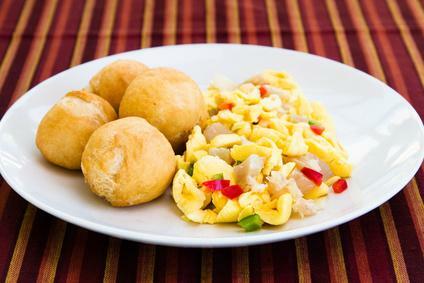 Dish is Photographed above as being served with Fried Dumplings.